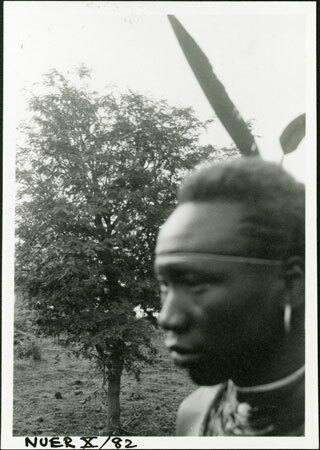 A head-and-shoulders portrait of a man wearing a body-cloth with feather hair decoration [poor focus], standing next to the Sobat River. Evans-Pritchard notes that this man could be an Anuak, but his initiation scars suggest that he is Nuer. Manual Catalogues [index taken from album book X, ms ink] - 82. Man (Nasser post) Anuak? Note on print reverse ms pencil - "28 5 A217" & print front border ms ink - "NUER X/82"
Morton, Chris. "?Nuer man" Southern Sudan Project (in development). 03 Jan. 2006. Pitt Rivers Museum. <http://southernsudan.prm.ox.ac.uk/details/1998.355.489.2/>.